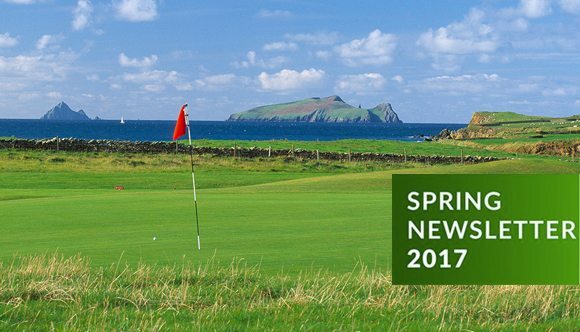 As the evening’s get long & the weather improves (hopefully), we’ve put together an update on golf in Ireland’s south-west. The winter in Ireland has been kind & except for recent wet spells, the courses are sure to be in prime condition for the coming season. 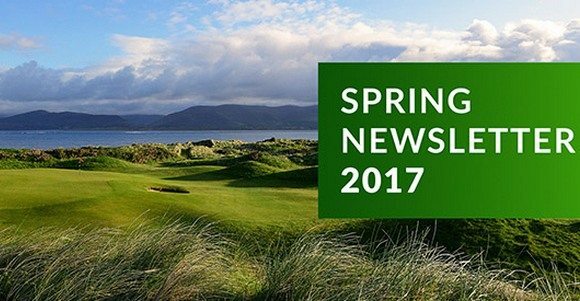 2017 is looking to be an exciting year for golf in Ireland, with an increase in visitors from North America & Europe expected for yet another year. The demand for golf in Ireland is very high at the moment and the Irish courses are working hard to ensure golfers have the most enjoyable of experiences. The big news around the south-west is the re-development of Adare Golf Club. Owner JP McManus has outlined his aspirations to bring the 2026 Ryder Cup to Limerick and the newly renovated golf course is expected to be magnificent. Renowned golf architect Tom Fazio has been contracted to oversee the re-development & Adare is set to open in September. 19 new bridges over the River Maigue. The course will also have SubAir technology under each of the bent grass greens which will ensure the putting surface will be in superb condition, no matter what the Irish weather can throw at it. Long rough will be a rare occurrence sand-based fairways will ensure the driest of playing conditions. As well as the golf course, there are several changes in the Adare resort itself, with the hotel getting a full renovation & an extension of the room capacity to 104 rooms, a stat of the art spa & a new golf clubhouse. This, along with a new caddy program will surely cement Adare’s place as Ireland’s leading 5-Star golf resort. KGFC has continued its renaissance since a major restructuring of the club in the summer of 2013. The club has invested heavily in the facility year on year and has now firmly become a must play for any group staying in Killarney town. Last winter saw the worst flooding in living memory at the club and despite this the courses presented at an unprecedented standard for the club last Summer. Members and guests alike provided rave reviews of the course presentation, conditioning, and consistency. This year the club has continued the hard work during the offseason and thankfully has enjoyed a more co-operative Winter from a weather perspective. – Killarney Golf & Fishing Club GM Cormac Flannery. First day of ‘balcony weather’ of the year! ?????????????????? Once all course work has been completed & Killarney has unveiled their course improvements we will be sure to post up some videos & pictures. Ballybunion has used the off-season effectively to improve their courses over the last number of years & this year is no different. The continued work on the course is a testament to Ballybunion and its commitment to staying in the top-ranked course in Ireland. Waterville has begun a refurbishment of its clubhouse this Winter which will be carried out in 2 phases. The development will include new bar & restaurant, a new pro shop, & new locker room facilities. One of the major developments over the past year was the development of the short game academy on the old Army barracks site located across the road from the 1st tee. This includes a short game range; chipping green and bunker practice area as well as practice driving bays. Lahinch Golf Club and Trump International Golf Links Doonbeg have combined to create the Great Irish Links Challenge. You can play two of the countries finest courses over 4 days, while also experiencing Irish Hospitality on the Wild Atlantic Way. There are daily prizes on offer & the winners will receive the coveted title of Great Irish Links Champion. Learn more about the Great Irish Links Challenge here.